This dish can be made any time of the the year but in high summer aubergines are ready in the UK, most likely grown in a polytunnel: support your local producer! This ‘Long Finger’ variety comes from Down Farm, near Winkleigh, just up the road from Viveka Gardens. Organic growers Liv and Henry grow top class veg and are part of Okehampton’s Harvest Co-op. You may have courgettes yourself and inevitably they are in a glut even if you have just one plant! Courgettes are a rewarding crop and great for beginners, plus the can also be easily grown in a pot on a balcony or small garden if you don’t have a growing space. With a sweet and sour taste, in Italian, agrodolce, caponata is a dish that evidences Sicily’s part Arab history. Traditionally the unique taste is achieved with honey and vinegar, neither of which are part of the veganyogi diet, so here date syrup and lemon juice substitute – great flavours of the middle east in any case. Capers are the buds of a semi-succulent wall-growing plant, or limestone cliff, and you can see them growing from the lime-based mortar of Roman ampitheatres in Italy. This dish is a bit of an acquired taste, but personally I crave it once in a while, once in a while only. 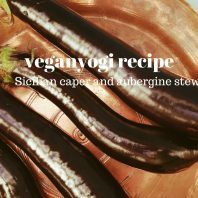 Aubergines and tomatoes in this recipe are part of the nightshade, or Solanaceae, family. This also includes potatoes, peppers and chillis, and sometimes this recipe uses peppers too. Nightshades make the blood more acid (adding lemon juice at the end, though it might seem paradoxical, helps blood alkalinity) and if you have rheumatoid arthritis or any other ongoing inflammatory condition you are probably avoiding this group anyway. In yoga terms they are not great for this reason but also because they stump a higher spiritual movement. If you find yourself getting too floaty with your practice, a jacket potato with ratatouille will bring you right back to earth! Last note: this dish doesn’t have an overt protein content so you might like to serve it with the lemon polenta cake for dessert, which has a proteinaceous mix of nuts, gram and polenta flour. The lemons in this cake can be substituted with blood oranges, so in February when they come in from Sicily, you could have a festa siciliana. When it feels ready, turn off the heat and add the lemon juice. Taste before deciding if you need to add salt; salt from the olives and capers may be enough. Serve with a wholegrain rice, couscous or – push the nightshade boat out – seasonal potatoes, and french or runner beans. Great to have as a starter a leafy salad with bitter leaves such as rocket or radicchio to stimulate digestion and liver function, as they do in Italy. It will help you process the nightshade compounds.